We’re getting closer and closer to the deadline that many Americans fear: the tax deadline. Many citizens might let their guard down as the mounting pressure gets to them. Unfortunately, this leaves the door open for scammers to take advantage of such a stressful situation. You may not realize it, but there are a number of frauds out there in which a scam artist attempts to pass themselves off as the Internal Revenue Service. Many citizens wouldn’t think twice about replying to an email from the IRS inquiring about sensitive financial information, and scammers prey on this trust. You can protect yourself by following some advice related by the IRS itself in a new report. First, it’s important to note that the IRS will never seek out such information, via an email or some other outlet. 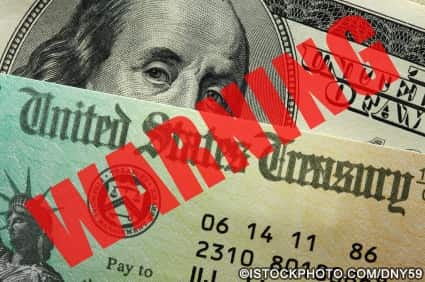 Alarm bells should ring in your head when someone purporting to be an IRS agent asks for your PIN, passwords to bank or email accounts, or credit card details. A true IRS agent has no reason to seek out such information. The IRS also won’t contact you by way of an email in the first place, nor will they get in touch with you through your Facebook or Twitter accounts. If you’re the recipient of such a message, the last thing you want to do is open an attachment or navigate an available link. Doing so could open your computer up to a virus or spyware that grabs ahold of sensitive data. An IRS logo is fairly simple to copy and paste into the body of an email, and closer inspection of the sender or link address of a fraudulent email will likely reveal that the “IRS” website ends not with .gov, as all government websites will, but with something like .net or .com. Whenever you’re the recipient of such a message, whether the communication arrives via social media, email, a phone call, a fax, or in the mail, it’s imperative that you contact the actual IRS at once at 1-800-829-1040 to explain the situation and ask them if they attempted to contact you in actuality. An IRS agent should be able to tell you pretty quickly if what you received was legitimate or a fraud. Should the message indeed be fraudulent, you have a few options. Scam emails should be sent to phishing@irs.gov so that the IRS can take a look at them. Exploration of the IRS website should also reveal additional information that can help you help them eliminate fraud. The more scams that get reported, the better. So if you’re ever targeted by someone attempting to gather sensitive financial data, contact the IRS at once.